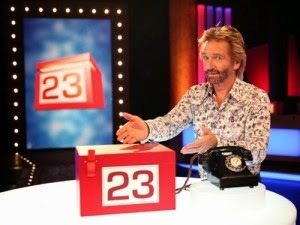 Will I get selected to be on Deal or No Deal and get the chance to Open Box no.23? I hope so! I've applied to go on Deal Or No Deal. I'd spent much time considering which game show to apply for and seeing that Supermarket Sweep is no longer running decided to apply for Deal or No Deal for a few reasons. I don't really understand the logic in it - is there any? 23 is my birthday, there is a special Box 23 on the show, and it's no.23 on my 40/40 project list. That spells LUCKY to me! There is a chance to win a VERY tasty £500,000 jackpot which would help me complete my 40/40 project, enable me to buy a woodland for my Healing Woods vision to help others and generally fund lots of Creative Adventures! Oh yes!!! EPIC! The application was quite long with 12 sections and I had to come up with interesting facts about myself, my most embarrassing moment, the most exciting thing that has ever happened to me along with a whole host of other questions! Filling it out did make me chuckle. So now I have to wait and see. I'll only get a call if they think I'll be good for the show....Will it be the Banker that calls me?? I'll let you know! Have you ever been on a Game Show? Tell me about your experience - I'd love to hear about it. Or do you have a burning desire to go on a Game Show too?